It is time to pay membership dues for 2019! Annual membership dues are still just $20 (individual or household) and were due 1 January 2019. 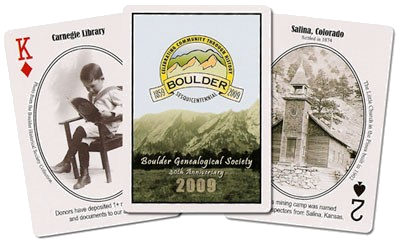 Your dues are the primary method we have for funding our genealogical society. Please also consider contributing to one or both of our donation funds, the BGS General Operating Fund and the Birdie Monk Holsclaw Memorial Fund. Options for paying: 1) Pay on-line; 2) complete a 2019 membership form and bring it with your payment to a Tuesday program meeting; or, 3) complete the membership form and mail it and your check to the address on the form. To see a description of the next meeting, click on “Monthly Meeting” under “Membership” above. Our color logo has been unveiled on a wide variety of fun and useful items. 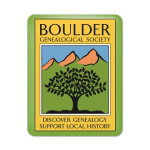 Visit the Boulder Genealogy store at Cafe Press and show off your BGS pride and support the Society with some of our BGS Gear! Annual volumes of the BGS Quarterly are now available for purchase! Order Quarterlies from 1969 through 2018 through Lulu.com. Can’t wait? Browse the quarterlies in our Instant Digital Download page. Check out our Publications page for more details. 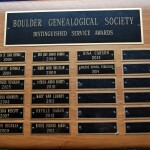 The complete names index for the BGS Quarterly is now complete. For instructions, click here. To open the PDF in your web browser, click here. 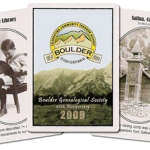 BGS continues to sell its commemorative playing cards celebrating both BGS’s 40th Anniversary and Boulder’s 150th Anniversary. Contact Dina Carson or Mary Ann Looney about pricing information and ordering cards. At the annual Dessert Night meeting BGS awards a member for distinguished service and contributions to the society over the years. Click here to see previous winners. If your family has been in Colorado a long time, you may qualify for membership in the Colorado First Families Program. For more information, click here. Click here for information about BGS members who have passed. Our Parliamentarian in Spirit will be missed. 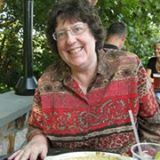 Visit her Facebook page here. More 1890 Census Replacement Project information has been posted! Check out the Projects page for more downloadable information about research topics, place names, and templates for easy extractions.